Sound is a major part of the driving experience. Factory exhausts utilize silencers that have been designed to meet several regulations and in turn rob the driver of performance and a sport tone. Quicksilver's developed an exhaust that meets the expectations of drivers seeking a performance sound from their exhausts and more performance. Weight has been reduced, aesthetics improved and performance increased with better thottle response and more power. Unique crisp sound rising in proportion with RPM. HP gains, more torque and a much more crisp throttle response. Accelerated gas-flows draw heat more efficiently away from the engine and floors. Quicksilver products ship directly from the UK. Item may take up to 4 weeks for delivery. Customers are responsible for all Taxes or Duty Fees. Quicksilver was established in 1973 to provide cars with higher quality and longer lasting systems. Today, their exhausts are manufactured in Great Britain and feature the ISO 9001 Quality Certification. 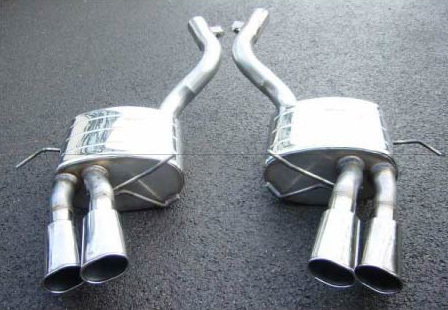 Vivid Racing carries two of the QuickSilver exhaust lines. These are the Sport and Titan Collection. The Sport series is designed for the majority of modern cars to enhance their sound and provide more performance. The Titan Collection is engineered to provide high quality performance with a unique sound and to reduce the weight of the entire system. This is achieved with the use of titanium and inconel to balance the weight, durability and performance.